Looking for healthy comfort food? 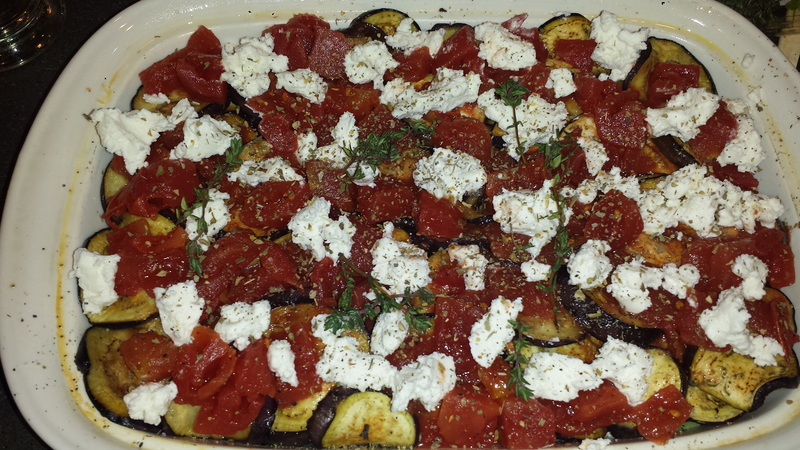 Picture yummy layers of roasted eggplant, caramelized onions, buttery mushrooms and creamy potatoes topped with fresh herbs, tomatoes and goat cheese. This is my favorite kind of food, loaded with flavor and oozing with goodness. You might ask, what exactly is a gratin? It’s a fancy name for a dish with a lightly browned crust of breadcrumbs or melted cheese, usually served in the dish in which it is cooked. The word ‘gratin‘ has an interesting history of evolution, from the original French which derives from the word gratter meaning “to scrape” or “to grate” as of the “scrapings” of bread or cheese. Le gratin evolved to signify the ‘upper crust’ of society and has subsequently been borrowed into the English language , particularly in food terms. Each layer in this gratin has something to offer. The creamy white potatoes on the bottom soak up all the lovely flavors and form a delicious bottom ‘crust’. Regardless of what you have been lead to believe, Potatoes are not worthless fattening carbs. They are complex carbohydrates which provide energy for our bodies along with significant amounts of Potassium and Vitamin C. The layer of caramalized onions is not only delicious but loaded with antioxidants and vitamins including vitamin B complex. Earthy mushrooms provide nutrients that are also found in meats, beans and grains like selenium, potassium , riboflavin, niacin, vitamin D, which makes them a great meat substitute. Eggplant with it’s gorgeous purple skin offers a host of vitamins and minerals along with it’s delectable flavor. 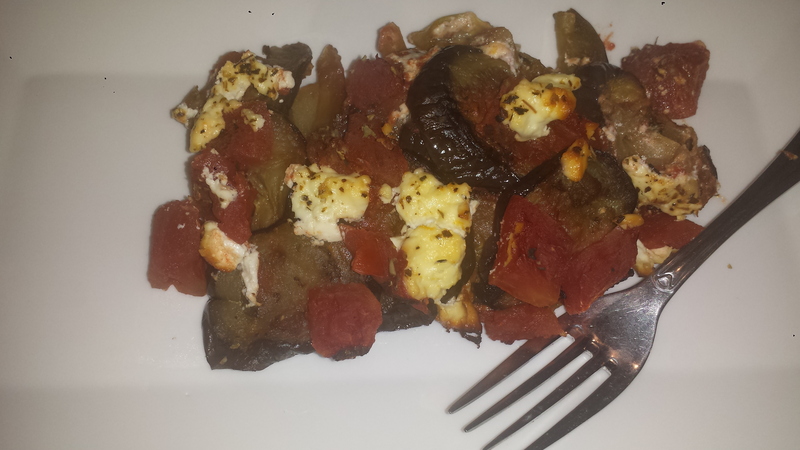 TIPS: I really love the tang that goat cheese adds but if you’re not a fan you can substitute your favorite cheese. Mozzarella, gruyere or parmesan are good choices. If you are vegan, use breadcrumbs instead of cheese. for a crispy top. If you don’t have the time or inclination to pre-cook the vegetables before layering them, you can skip a few steps. Instead of roasting and boiling you can bake the mostly raw ingredients which is easier prep but will take quite a bit longer to cook. You will lose some of the nuances of flavor but it should still be delicious. Don’t skip the step of salting the eggplant but while it’s resting, chop onions and saute them with garlic until soft. Slice all vegetables ( I would omit the mushrooms since they make so much water) and layer them raw as per the directions. You may want to store the sliced potatoes in cold water or slice them last to prevent browning until you’re read to layer. I would wait on the last layer of cheese or it could get overbrown. You may not need as much broth as the raw veggies have so much water. Cover tightly and bake for one hour. At 30 minutes, using a flat spatula, press vegetables down so juices come to surface. If it seems dry add a bit more liquid. At 60 minutes, uncover, press veggies again and check for doneness. If veggies seem soft sprinkle with cheese and bake another 15 minutes or until cheese is golden brown and juices have evaporated. Otherwise, cover and bake another 20 minutes or so. 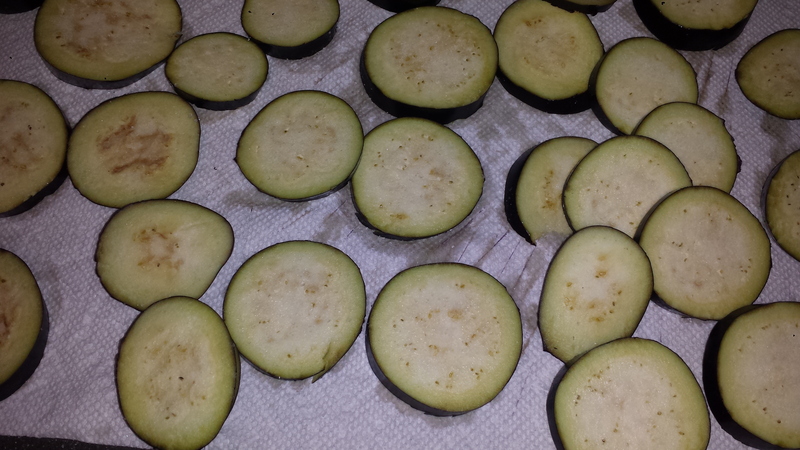 Slice eggplant into 1/4 inch rounds and spread in a single layer on paper towels. Sprinkle liberally with salt and let sit at least 10 minutes or until you see beads of water forming on their surfaces. 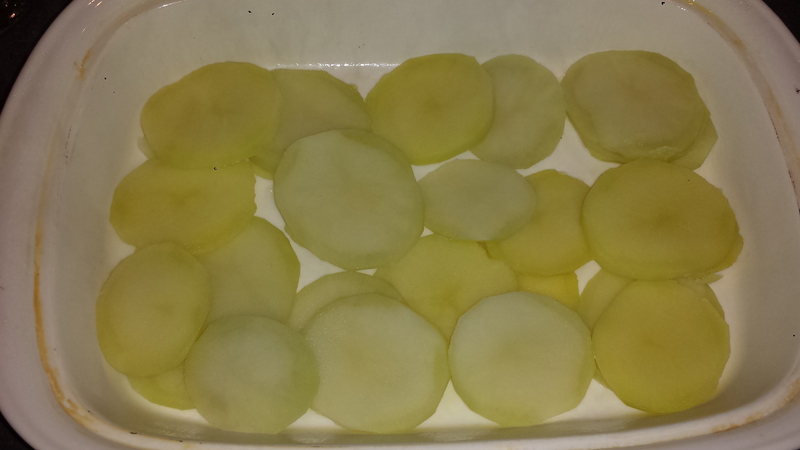 Peel and slice potatoes, slice into 1/4 inch rounds and place in a pan filled with cold, salted water. Heat the potatoes to a boil and cook for about five minutes, until slightly soft but not losing it’s shape. Drain and rinse with cold water. Lightly oil the bottom and sides of a baking dish. Layer the potatoes in the bottom of the dish. 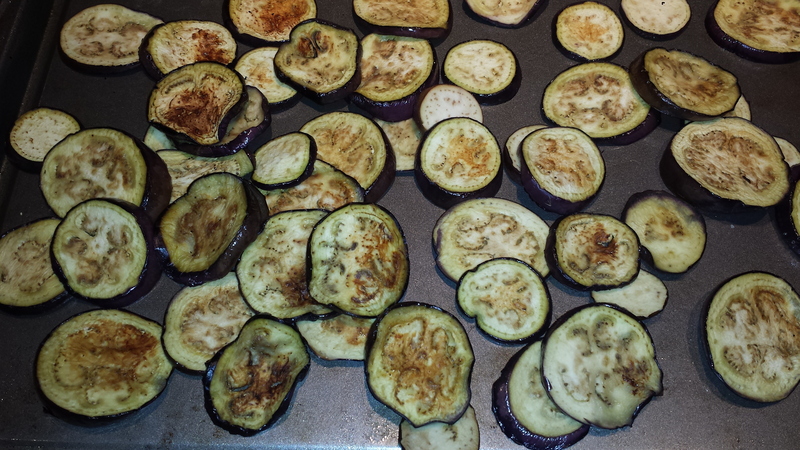 Lightly oil a baking sheet and arrange eggplant circles in a single layer. Brush with olive oil and roast in a hot (450 degree) oven for about 10 minutes, turning once. Remove from heat and let sit. Peel and slice onion into 1/4 inch rounds. Brown them in a frying pan with about a Tablespoon of oil over medium high heat. Flip to brown the other side, then break circles apart and add garlic. Let sit for a few minutes of lower heat until softened. 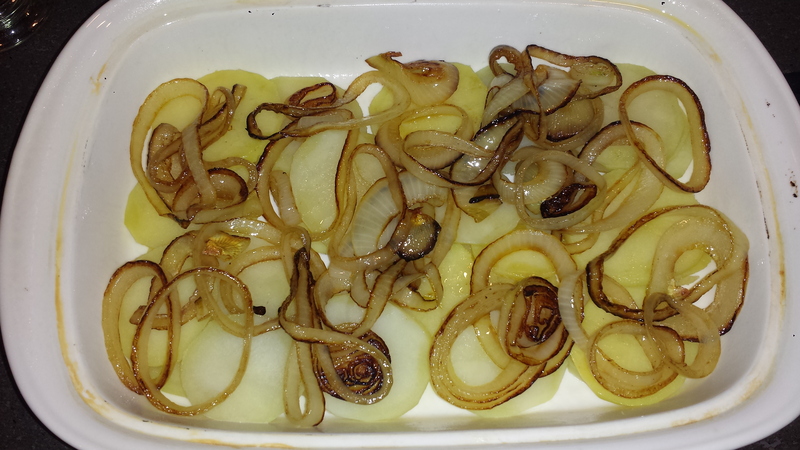 Layer the onions over the potatoes. Clean the mushroom caps with a damp paper towel and slice in half horizontally. Add a bit more oil and saute until golden on each side. Layer over the onions. Dot the vegetable mixture with about half of the goat cheese. Sprinkle with herbs, salt and pepper. 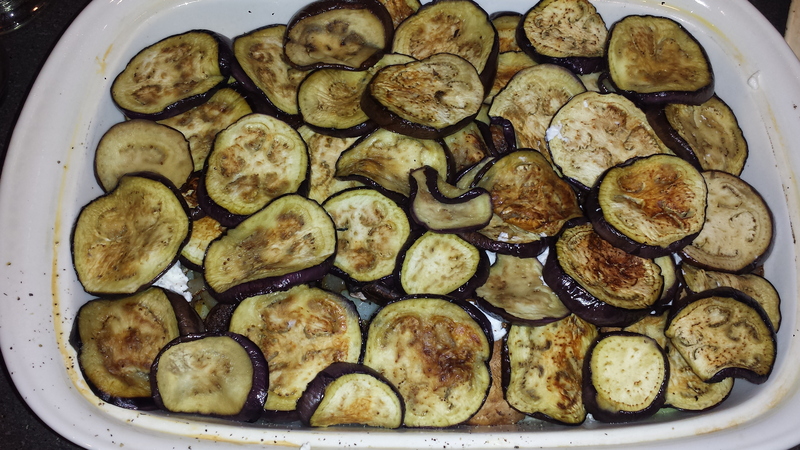 Add a layer of eggplant slices. 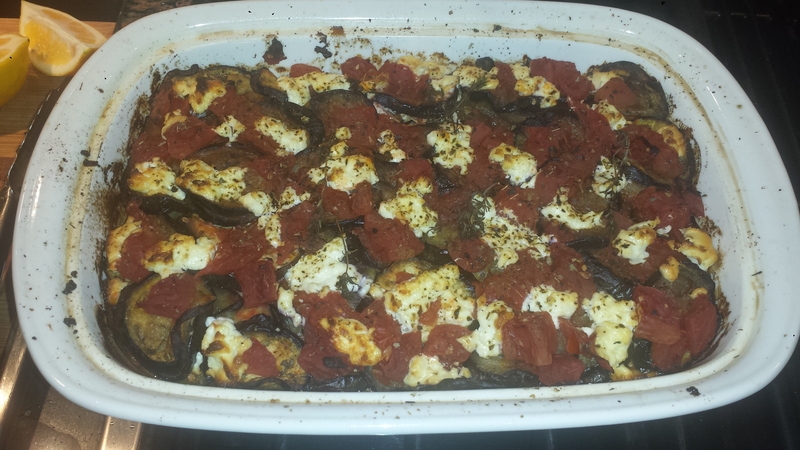 Pour the tomatoes evenly over the eggplant and dot with the rest of the goat cheese. Pour vegetable broth over the top. Add sprigs of thyme, and sprinkle with salt and pepper. Bake at 425 degrees for about a half hour, covered. Check after 15 minutes, if it’s not starting to bubble add a bit more broth. Then uncover and let bake another 5 to 10 minutes. Peel and slice potatoes, slice into 1/4 inch rounds and place in a pan filled with cold, salted water. Heat the potatoes to a boil and cook for about five minutes, until slightly soft but not losing it’s shape. Drain and rinse with cold water. Lightly oil the bottom and sides of a baking dish. Layer the potatoes in the bottom of the dish. This entry was posted in All Recipes, Dinner Parties, Meatless Monday, vegetarian and tagged Eggplant, Eggplant Potato Gratin, Eggplant Potato Mushroom Gratin, Eggplant Potato Tomato Gratin, gluten free, goat cheese, Goat Cheese Gratin, Meatless Monday, potato gratin, vegan option, vegetarian, Wheat Free. Bookmark the permalink. Hi Laurena. I would love to hear how you veganize this dish, with breadcrubs, vegan cheese or other. Thanks for following.